The Burt Award 2016 winners were announced at a ceremony in Nairobi on September 2016. They are Nicholas Kamau , Alice Muthoni and Tony Mochama. The Burt Award for Young African literature is one of the richest around with writers going home with thousands of Canadian dollars. Previous winners of this prize include Chris Okemwa (2015), Elizabeth Kibui (2014), Argwings Otieno (2013) and Antony Mugo (2012). 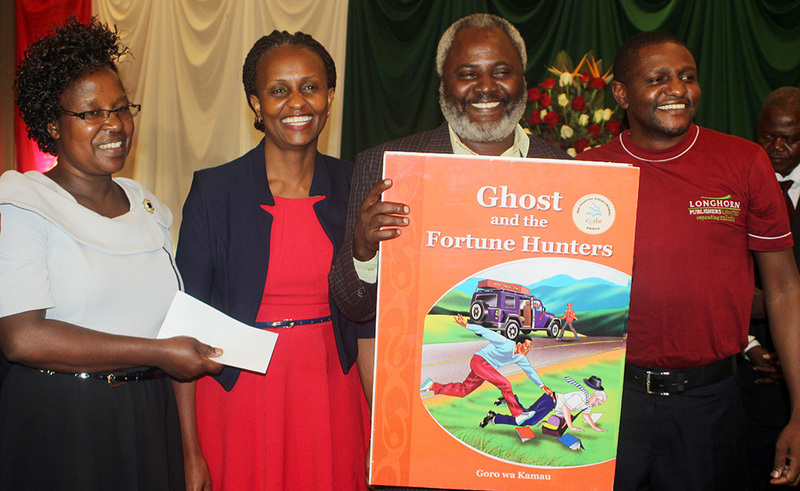 The three winners and their books were first Nicholas Kamau for Ghost and the Fortune Hunters, Alice Muthoni for The Hidden Package and Tony Mochama for Run, Cheche, Run. The event at the Crown Plaza included speeches from Ruth Odondi -CEO of the National Book Development Council of Kenya (NBDCK), CODE’s partner in Kenya. Professor Chris Wanjala (Chairman of the NBDCK) underscored the importance of writers in society and their need to have their rights protected at all times. Dr. Waveney Olembwo, spoke on behalf of the Burt Award jurors and shared their experiences working with the authors and publishers of the winning titles. Also giving an address was guest of honour Ezekiel Mutua. In attendance at the colourful ceremony were Marie-France Provencher, First Secretary of the Canadian High Commission; The Honourable Noah Katana Ngala, Chairman of the Kenya National Library Service; Brigitte Doellgast, Head of Library Services-Sub-Saharan Africa, Goethe Institute; Eliphas Nyamogo, Head of Information and Library, Goethe Institute, Kenya; Dr. Kiprop Lagat, Director of Culture, Ministry of Sports, Culture and Arts and Richard Atuti, Director of the Kenya National Library Service. The ceremony was one of the ceremonies that were part of the Nairobi International Book Fair 2016. Pingback: Muthoni wa Gichuru is CODE Burt Prize for African Young Adult Literature Kenya 2018 winner.